tammy's blog: I love hot stuff! I love hot stuff! I'm usually the one able to enjoy food that is too spicy for weaker people. So when I discovered these chipotle peppers in adobo sauce I thought I found something wonderful. This thick, dark red adobo sauce looks so succulent with these beautiful chipotle peppers, and the smell is heavenly. Such a smokey, spicy flavor - how could I go wrong? A few months went by and I thought I'd try again. I was making cornbread and wanted to spice it up. I added two spoonfuls of this "fire in a can" to an entire batch of cornbread. This time it was hot, but tolerable. But this left me with a dilemma....what to do with the remainder of the can. Well, if the cornbread wasn't too bad, I should be able to add the remainder of this small can of peppers to an entire pot of Mexican rice and not inflict hellfire and brimstone on my taste buds, right? Oh contrare Pierre......it was incredibly, incredibly HOT. 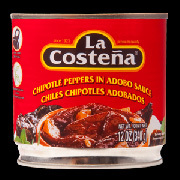 So lesson learned here is: when using La Costena chipotle peppers in adobo sauce, be VERY sparing and sample as you cook. It's a good thing chickens don't have sensitivity to hot food. They love it!